Keep your home up-to-date starting with your floor. Use this guide to the hottest 2019 vinyl flooring trends and find stylish, durable vinyl flooring ideas that will stay trendy for years to come. Believe it or not, this is my favorite of all the flooring trends! Truth is, vinyl gets a bad rap. Remember that ugly, dated, 1980s vinyl commonly confused with linoleum? Of course you do. That’s probably the first thing you think of when I say “vinyl flooring”. But! The world of vinyl flooring has changed. In fact, vinyl flooring has evolved more than any other type of flooring in the last decade, if you ask me. Each year, vinyl manufacturers are stepping up, creating more realistic looks and even cooler features. Ten years ago, homeowners were forced to choose between wood or laminate for wood looks and between tile and stone for stone looks. Those days are gone. In fact, over the last decade, there has been somewhat of a technological revolution in the flooring industry. I know, I know. Technological revolution? For flooring? But, it’s true. Vinyl flooring has several trends of its own, but additionally, vinyl flooring as a whole is trending right now. Originally saved for commercial spaces, vinyl is making its way into more homes than ever before. This year, you will see vinyl in more businesses and homes than ever before. Advancing technology has given vinyl manufacturers the ability to develop shockingly realistic tiles and planks mimicking natural looks, such as wood and stone. They also have the ability to create unique, decorative looks currently unavailable in any other style of flooring. The trends in 2018 were all about disguise, floors masquerading as other materials. And, in 2019, that trend is still going strong. Get ready to see some gorgeous wood looks (including handscraped and distressed looks! ), natural stone looks, metallic looks and more. Vinyl is taking the flooring world by storm in 2019 and it’s going to be quite the exciting ride. *Note: Quotes from 2018 that still hold true in 2019. As I mentioned, the coolest thing about this year’s vinyl flooring trends is the realistic looks manufacturers are able to accomplish. 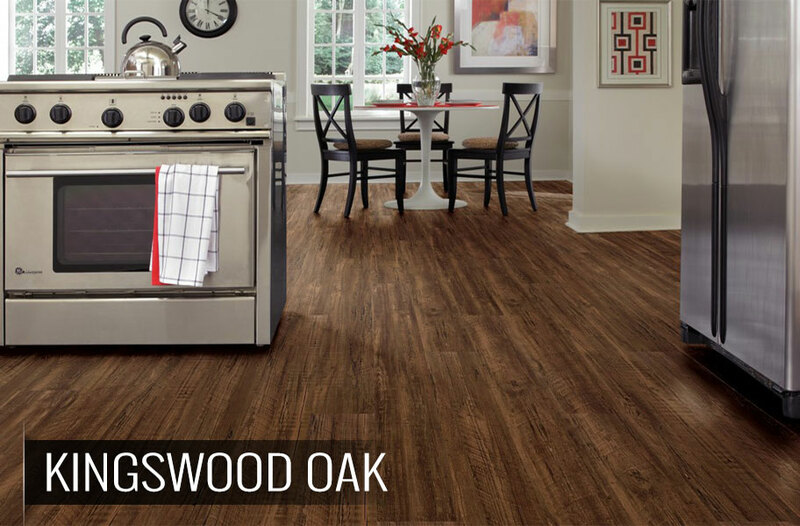 Once upon a time, realistic wood-look vinyl flooring was unheard of. Now, I bet if I showed you some current options, you’d never guess they were vinyl! Currently, you will find vinyl flooring available in styles that mimic current wood and tile flooring trends, and even a few vinyl-specific trends as well. 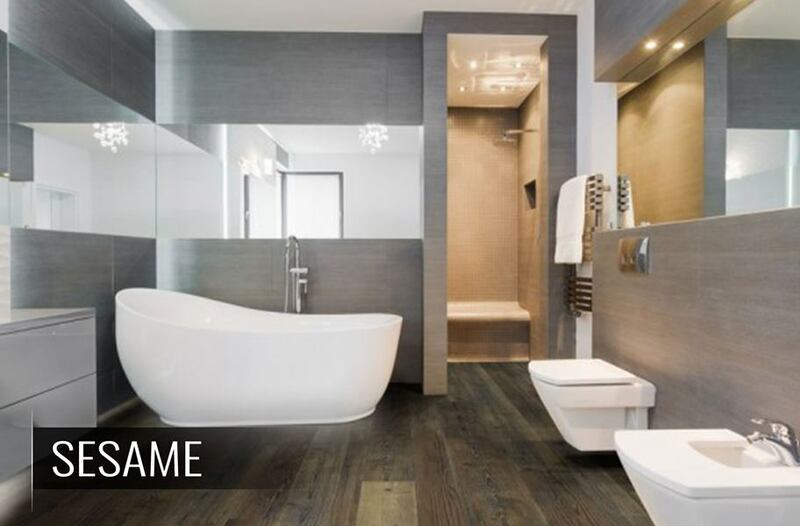 Once upon a time, laminate was the only wood-look flooring in the limelight, the Ferrari of wood-look flooring. Then vinyl, flooring’s Lamborghini, jumped into the realistic wood-look market and gave laminate a run for its money. This has caused both flooring manufacturers to improve at lightning speed, each trying to keep up with the other. You know what they say about competition – it forces you to bring your A-game. And with so many faux wood flooring options on the market, it’s become imperative that everyone bring their A-game if they want to stay relevant. The moral of the story is that wood-look vinyl is just as realistic as wood-look laminate, but with even less maintenance and even more versatility. The days of outdated 1980s vinyl are behind us and you can now find vinyl in shockingly realistic wood looks that will convince even the most serious skeptic. And that means, with its waterproof capabilities and ease of maintenance, vinyl flooring is on the rise. And fast. Wood-look vinyl has also become increasingly popular for commercial use. Have you noticed that all of the sudden your favorite restaurants and grocery stores are getting updated with floors that look like real hardwood? No, they did not put solid hardwood in the grocery store. It would be a maintenance nightmare with constant spills and scratches. I can almost guarantee that trendy new look is luxury wood-look vinyl. 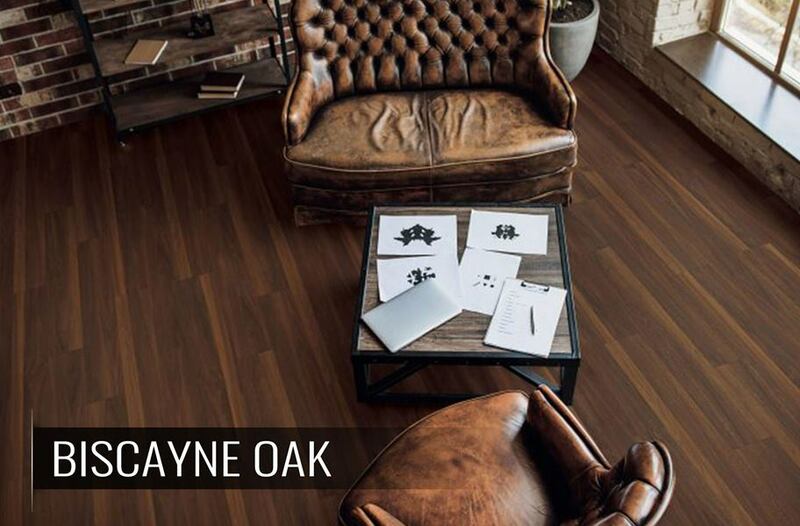 In 2019, vinyl manufactures will only be producing even more convincing wood looks mimicking the hottest wood flooring look and texture trends. While vinyl typically uses embossing and prints for their looks rather than real scrapes and wirebrushing used in hardwood, you can still expect to see vinyl floors mimicking these looks in 2019 and beyond. Handscraped looks feature long, ingrained scrapes with high variation between planks, making each individual plank appear handcrafted, unique and rare. Wirebrushed looks show subtle, intentional wire scratches leaving the appearance of exposed wood on the surface. These imperfections are smoother and more consistent than handscraped or distressed looks. Distressed looks are often mistaken for handscraped. Distressed looks, however, look as though they’ve been through a lot of wear and tear. You can expect to see the appearance of scrapes, burns, knots, wormholes and more, giving these floors an aged, antique look. Will the wood-look vinyl flooring trend last in 2020 and beyond? 1,000 times, yes! Wood-look flooring will be trending for the foreseeable future and vinyl will only gain momentum and popularity over the next decade. Once upon a time, porcelain and ceramic tile were the only way to get a beautiful, durable, realistic stone look. Tile manufacturers had a monopoly on this market so there was no reason for them to push for big improvements. These days, technology allows for more types of flooring to share the scene. So everyone has to make their looks more convincing, stylish and durable if they want to play this game. While laminate has always focused almost exclusively on wood looks, vinyl is known for its versatility in style and looks. 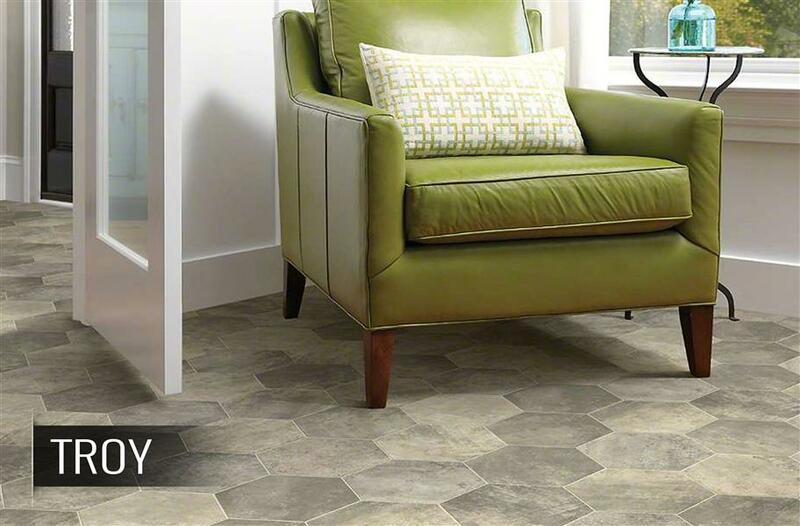 You will typically see stone looks in luxury vinyl tiles (LVT). Just like wood-look vinyl, stone-look vinyl uses the same technologies to create looks mimicking gorgeous, timeless natural stone. You don’t have to pay a fortune for soft, porous marble; stone-look vinyl flooring has changed the game. For the better. 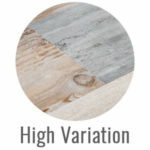 In 2019, vinyl manufactures will be producing even more convincing wood looks mimicking the hottest stone and tile flooring trends. Marble. Chic and timeless, marble is one of those looks that will never go out of style. Marble is known for its unique veining and gorgeous translucence. It’s also known for being soft and porous. In 2019, you’ll see lots of marble looks, particularly Carrara, in durable, nonporous LVT. Slate. Sharp and contemporary slate looks will be super trendy in 2019. Although the most common will be the dark chalkboard look, slate comes in a number of colors and slate-look vinyl will mimic them all. Travertine. Want to make it look like you live in a castle? I mean, don’t we all? Travertine is the floor of castles and ancient architecture. But it’s only increasing in popularity in 2019. The versatile, neutral colors with distinctive patterns and veining are a timeless look that you can now find in affordable, low-maintenance LVT! Will the stone-look vinyl flooring trend last in 2020 and beyond? Yes, yes. yes! Vinyl is giving porcelain and ceramic tile a run for their money with equally convincing stone looks with more warmth and resilience than traditional tile. Stone looks are timeless, and now that they are more accessible, you will see stone-look vinyl well into the next decade and beyond. You guys! This stuff is so cool. I’m kind of obsessed. Now, I’m not talking about an entirely gold floor like you’re a super rich oil tycoon designing your palace. Although, if you are, I would love to help with that, too. No, these are more traditional wood, stone and decorative looks with just a little extra shimmer. Of course, the metallic look does not look natural or realistic, two big 2019 flooring trends. But, it does look really cool. Expect to see these metallic looks pop up in bathrooms, businesses and bold spaces. They certainly make a statement so it’s important to pair them with the right decor. Will the metallic-look vinyl flooring trend last in 2020 and beyond? 2030? Eh, I don’t think so. It’s so cool but also so specific. And, I predict that trends will only continue towards nature and realism. So, concrete floors are pretty popular right now. People are still experimenting with that industrial look and concrete can provide a sleek, upscale, modern look with the right decor. While concrete is known for being a cost-effective flooring option, vinyl flooring, even luxury vinyl tile, is also known for being super affordable. And ya know what vinyl is not known for? Poor aching feet from standing all day on a floor with absolutely zero give. Yeah, concrete is not awesome on your joints so homeowners are now looking for this hot look in other flooring options. Vinyl floors are known for their resiliency and growing realism as they embrace all the hot new looks on the flooring market. In 2019, you’ll see concrete-look vinyl in trendy condos, New York apartments and lots of up-and-coming spaces. Will the concrete-look vinyl flooring trend last in 2020 and beyond? Again, maybe over the next few years, but eventually, the trend towards nature will knock ’em out of the limelight. Vinyl flooring has come a long way from the ugly tiles and sheets seen 30 years ago. Now, you will see updated sturdy tiles and rigid wood-like planks. The hottest types of vinyl floor have been (and will continue to be) Luxury Vinyl Planks, Luxury Vinyl Tiles and Wood Plastic Composite. These 3 types of vinyl really take things to the next level as far as looks, durability and features. Vinyl has always been kind of the dark house in the flooring industry, but these new and exciting types of vinyl are really changing that. So this is a dark horse you want to put your money on! Writing about flooring, sometimes I forget that some people have never heard of WPC flooring. WPC stands for wood plastic composite but is also commonly referred to as waterproof core. WPC vinyl plank flooring and WPC vinyl tile flooring are best known for being 100% waterproof. 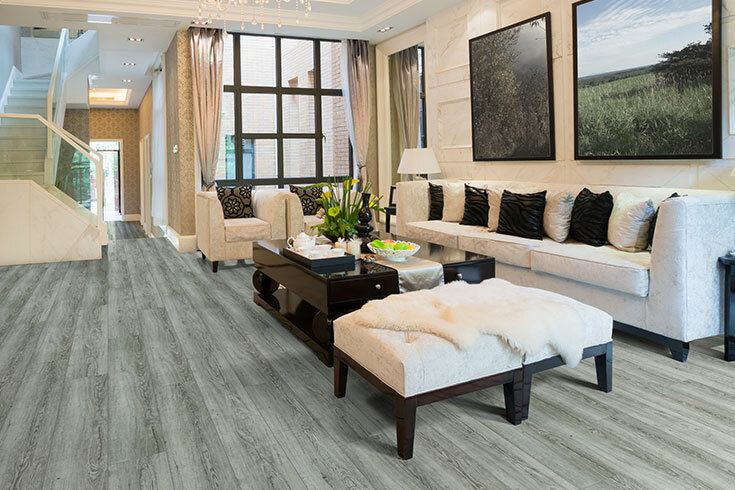 You can think of WPC flooring as luxury vinyl flooring amped up a notch with a special waterproof core that makes it perfect for just about any room in the house. 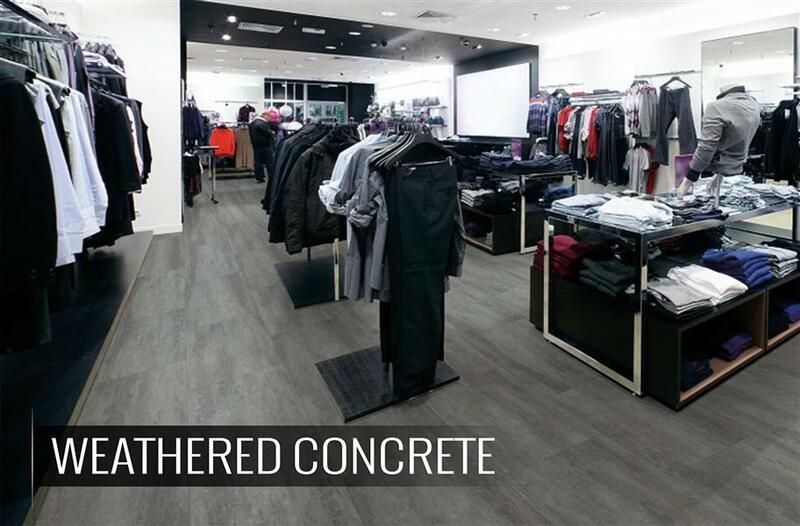 So it’s not just the waterproof capabilities that make WPC one of the hottest trends on the flooring market. Because this is the best of the best, the looks and realism are top notch. 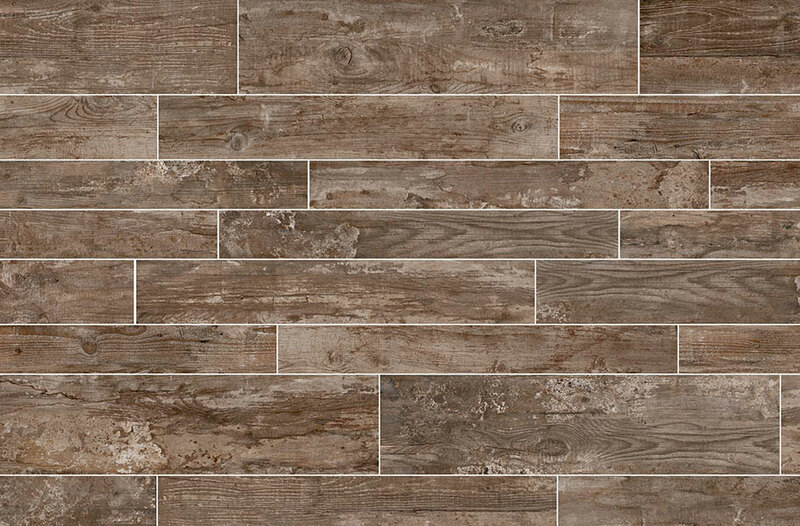 You’ll see WPC vinyl planks with prints mimicking the hottest wood trends including distressed and handscraped looks that can fool even a discerning eye. WPC first started gaining popularity in commercial spaces. Did you notice that all of the sudden restaurants and grocery stores started popping up with floors that look like wood? I’d be willing to bet they’re actually vinyl and, likely, WPC vinyl. Now, WPC vinyl is transitioning into homes as homeowners discover its durability and all of the benefits of having a fully waterproof floor. You’ll see them all over the home but especially in kitchens, bathrooms and basements. You know, those pesky water-prone areas. Related content >> What is WPC Vinyl Flooring? Okay, so I’ve really talked up WPC flooring. Yes, it’s really cool. But, we decided to test it to make sure it is just as incredible as we think it is. We wanted to put WPC vinyl’s ability to hold up to water damage and stains to the test and soaked that bad boy in red wine for 24 hours. We compared it to laminate and engineered hardwood to see how each floor would hold up. Watch and see what happened! Will the WPC vinyl flooring trend last in 2020 and beyond? If there is one thing I’m certain of, it is this: yes! WPC flooring will only gain popularity over the next several years, and likely, beyond. This is where some people get confused. LVP, LVT and WPC vinyl are not interchangeable terms. All WPC vinyl planks are luxury vinyl planks. But not all luxury vinyl planks are WPC. It’s like whiskey and bourbon. All bourbon is whiskey. But not all whiskey is bourbon. Bourbon is special; it’s better (okay so that’s just my opinion, but I stand by it!). WPC is like top shelf bourbon – the best of the best. LVP and LVT are like whiskey. “Luxury” means they’re tougher, more durable, longer lasting, and (usually) more beautiful than older, outdated vinyl planks. 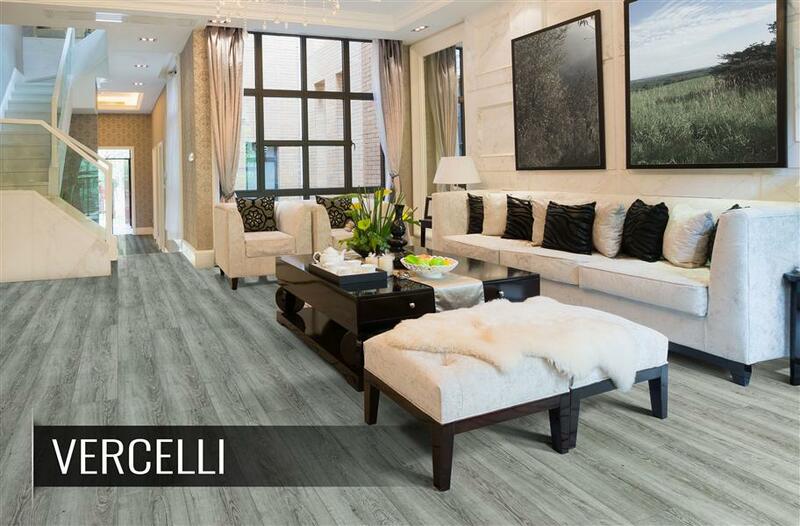 These luxury vinyl planks feature a protective wear layer that works as a bodyguard to keep your floor safe from all the elements. Just like WPC, you will see realistic LVP prints in all the hottest wood trends without but with way less maintenance. 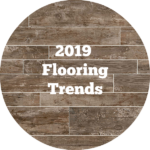 Will the luxury vinyl plank flooring trend last in 2020 and beyond? Absolutely. 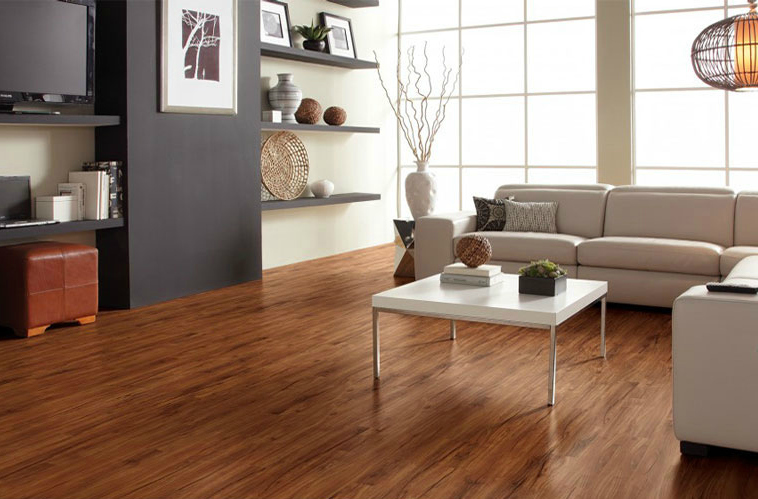 In fact, in coming years you will only see more vinyl as it begins to overtake laminate flooring. LVT typically offers realistic natural stone looks. It’s a warmer, more resilient alternative to tile, still giving gorgeous stone looks at an affordable price. When vinyl first started gaining popularity, it was all about the tiles. This was before manufacturers developed these ultra-convincing wood looks. 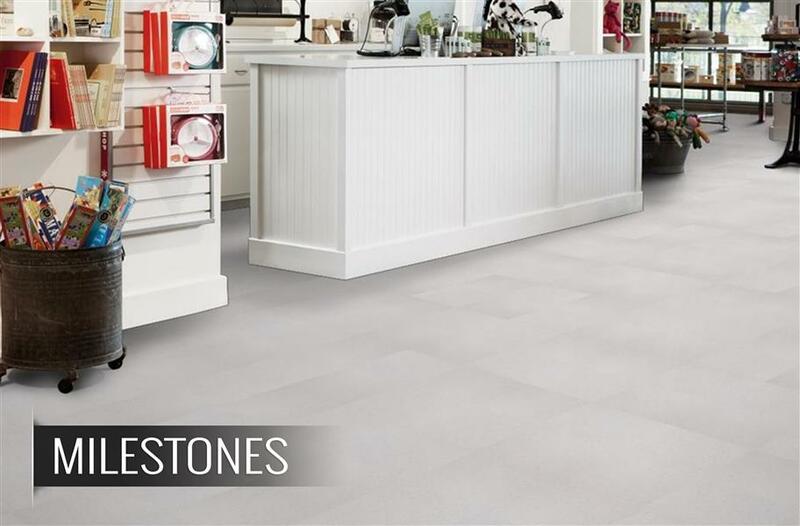 These tiles are still trendy; stone looks are classic and will never go out of style. However, I would steer you towards luxury vinyl planks over luxury vinyl tiles. Will the luxury vinyl tile flooring trend last in 2020 and beyond? Yes and no. Luxury vinyl tiles will maintain popularity, but luxury vinyl planks will really take off over the next decade while LVT stays consistent. Rigid core vinyl flooring is exactly what you’d expect: vinyl flooring with a tough, sturdy, rigid core. The rigid core allows you to install your vinyl floor in areas you wouldn’t normally be able to. Most of the time you have an existing flooring. Or uneven concrete. Or a number of other bumps and hiccups causing your subfloor to be something other than the desired pancake flat surface most installation instructions call for. Basically, rigid core is like WPC vinyl on steroids. 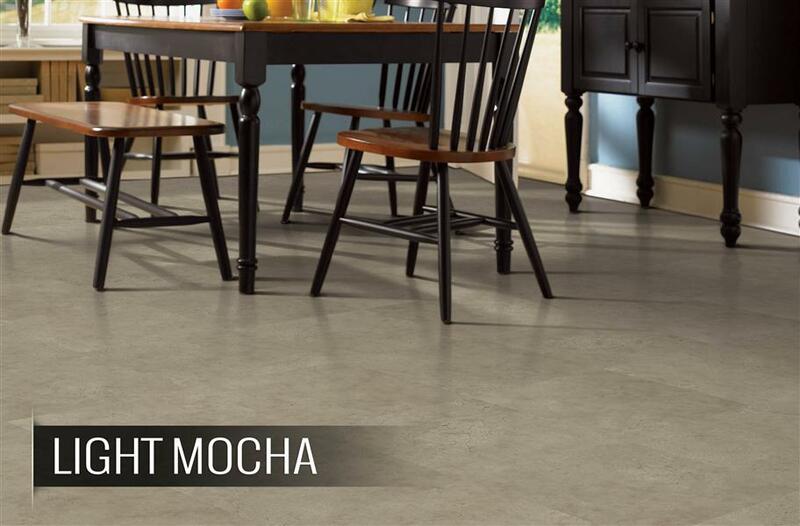 You get the tough, waterproof, gorgeous floors WPC is known for with that new, extra-strong rigid core. It’s no wonder this new flooring idea is taking off at lightning speeds! Will the rigid core vinyl flooring trend last in 2020 and beyond? Absolutely! In fact, 2019 will just be the beginning of a trend I expect to see grow for decades to come. Or maybe you do? Either way, you do you. Anyway, it’s not necessarily the look or the style that is trending here (although some options you can see in their look, too); it’s the idea that these new options are now available. You see, vinyl flooring is all about making your life easier. Less maintenance, easier installation, more longevity. I’ve said it before and it still holds true: vinyl is the busy homeowner’s flooring. In 2019, you’ll see a lot more DIY installation options in addition to vinyl floors that look even more like the floors they’re mimicking. Hint: There may or may not be grout lines. Vinyl flooring is all about ease and convenience. Easy to clean, easy to keep looking fabulous, and with loose lay vinyl planks, easy to install, too! Installing loose lay vinyl planks could not be easier. DIY options are trending up. With the increase of house flips and remodels, it is becoming more common for homeowners to take these upgrades into their own hands. Want to know what you need in order to install loose lay vinyl planks? Perimeter tape. And the planks. And before you worry that this affects the durability, these are high-quality luxury vinyl floors, many with lifetime warranties. Simple and dependable. Loose lay planks are relatively new to the world of vinyl flooring. Now, many of the trendy wood-look luxury vinyl planks come in these DIY-friendly loose lay options. 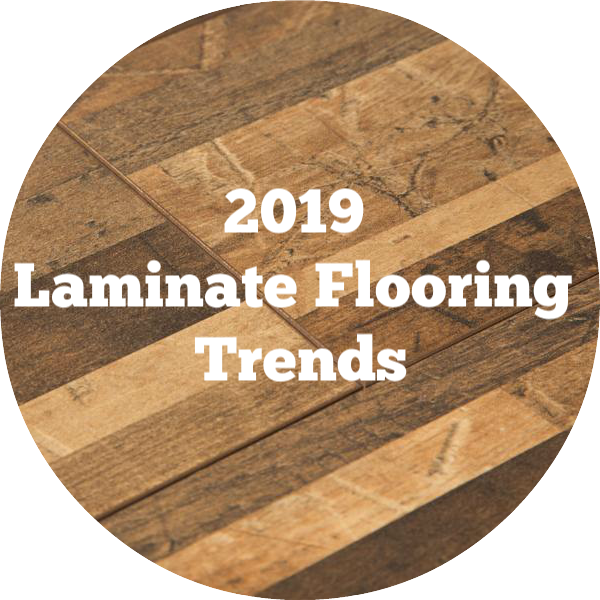 Will the loose lay vinyl flooring trend last in 2020 and beyond? Probably. My prediction is that manufacturers will trend towards interlocking planks more than loose lay. 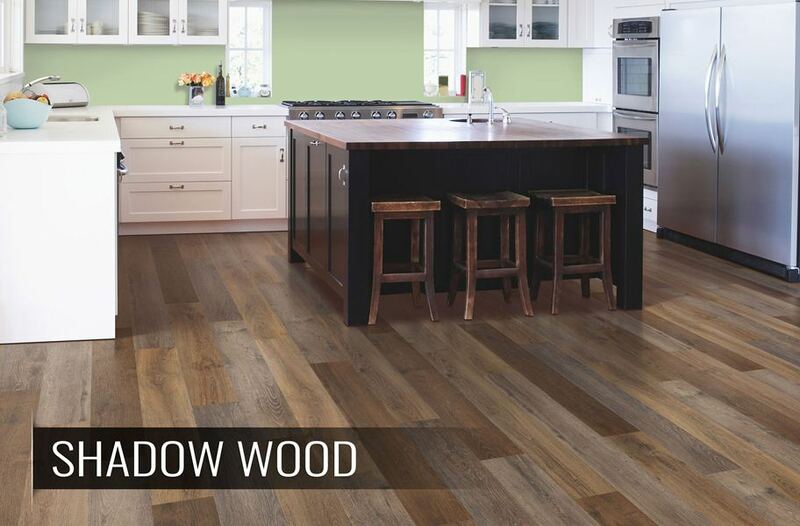 However, manufacturers will continue to produce beautiful loose lay vinyl planks to appease the DIY market. Once the floor is installed, no one will know the difference so this is simply more of a customer preference. 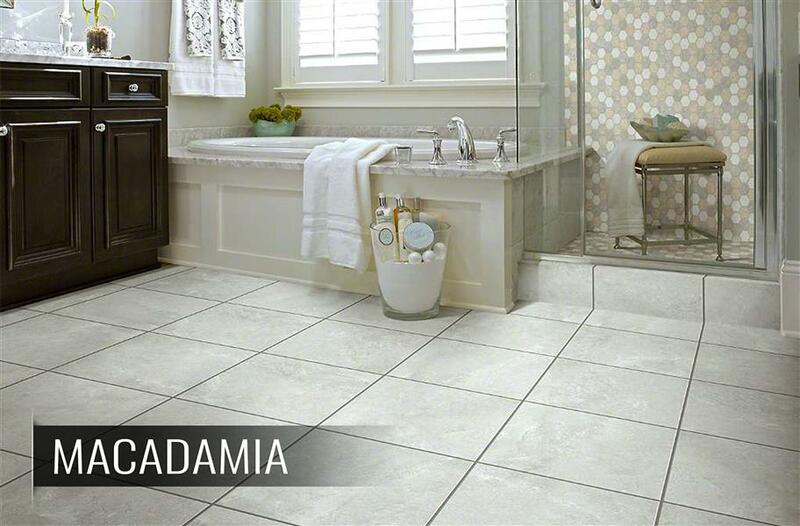 Vinyl tiles have been competing with porcelain and ceramic tile for years as they mimic natural stone looks with less maintenance and a lower price tag. Tile has this wonderful reputation as durable, high-quality flooring. But vinyl? Ugh. Poor vinyl got a bad rap back in the 70s. But today’s vinyl is probably the best option on the flooring market when you look at durability, looks, price and maintenance. In an attempt to fool naysayers, vinyl manufacturers have introduced a new type of vinyl tile that is groutable, just like traditional porcelain and ceramic tile. Now, you can find luxury vinyl tiles that look just like their ceramic competitors but with more warmth and resilience. In the next few years, you will see lots of stone-look groutable vinyl tile options popping up all over the flooring market. Will the groutable vinyl tile trend last in 2020 and beyond? This is a tough one. Groutable vinyl is still very new. I do think it will stay in style, but I don’t foresee it becoming the next big thing. I still think wood-look WPC vinyl is where it’s at in the vinyl world. Also, if there’s one thing I hate about tile, it’s grout lines. Why, oh why, would we use them if we don’t have to?! In 2018, colors were all about extremes. Ultra dark, ultra light and not much in between. Except for every shade of gray. Gray is kinda special. Going into 2019, those extremes are still holding strong. In fact, the lights are getting even more extreme with more white-washed, beachy looks. But you’ll see some warmer, middle-of-the-road options sneaking in, as well. 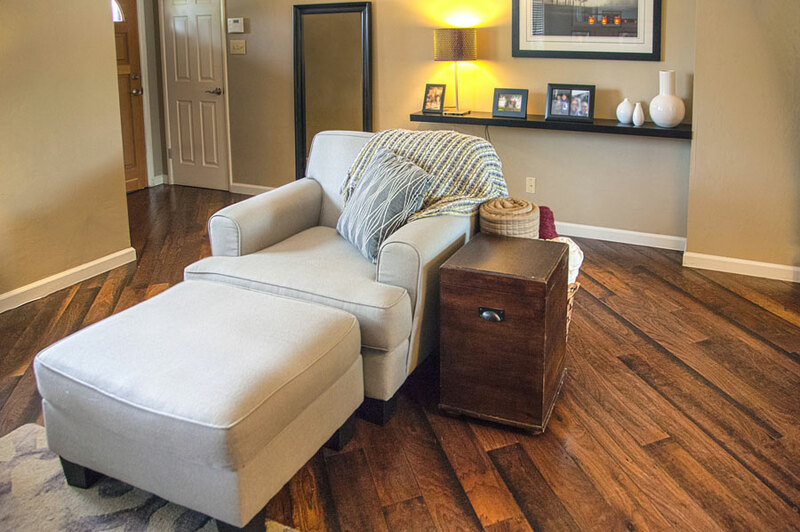 Homeowners are increasingly using flooring to set the tone or feel of their home. That means, we need more options! And manufacturers are responding with more beautiful colors than ever before. Of course, not all of them are trending. Here are the best vinyl floor colors to stay trendy in 2019. Dark vinyl floors are still going strong. The downside to dark floors is they can make your room look smaller. You know how you (or some woman in your life) looooove that little black dress because it makes you look end-of-the-stomach-flu-skinny? Well, that’s because dark colors naturally make things appear smaller. This is great for your wardrobe. But, maybe, not-so-great for your floor. Additionally, dark floors are notorious for showing every scratch, speckle of dirt or imperfection. This is less of a deal with vinyl than wood since vinyl has that nifty little wear layer, making it less prone to scratches. However, no floor is dirt proof. That’s just a part of life. It’s the same reason we don’t drive black cars here in Arizona. They just don’t ever look clean. 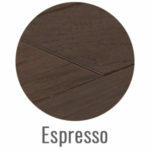 Will the espresso wood-look vinyl flooring trend last in 2020 and beyond? I don’t think so. Espresso looks have been trending for quite some time and I feel they are likely near the end of their lifecycle. I predict that in the next 5 years or so, espresso and other dark looks will be on their way out as blondes and whitewashes steal the scene. For years, lighter floors were viewed as outdated or inexpensive. That is no longer the case. Not by a long shot! As more homeowners embrace the light, airy feel in their home, you will see a huge resurgence in blonde wood (and wood-look) floors. These blonde colors can give you that light feel, while still feeling timeless. With versatile blond wood looks, your decorating possibilities are endless. 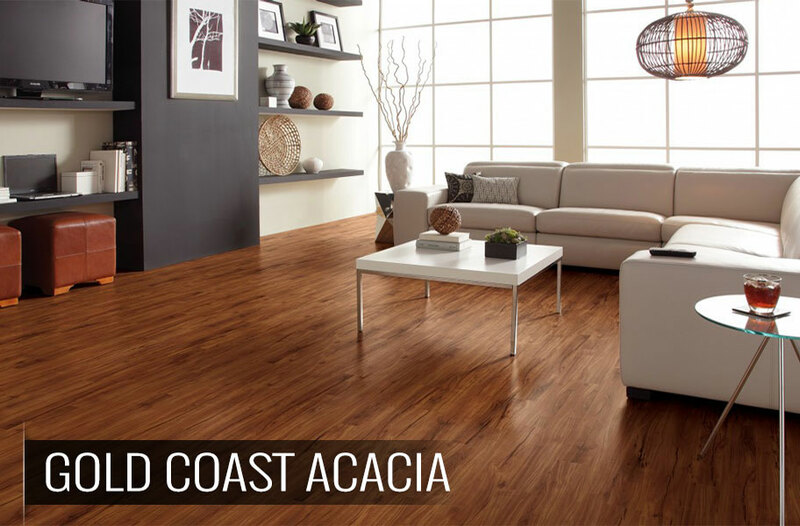 You can go for a chic, contemporary feel or a rustic, homey vibe all without changing your floors. Also, you know how I mentioned dark vinyl floors can make your home seem smaller? Good news; blonde vinyl does the opposite! 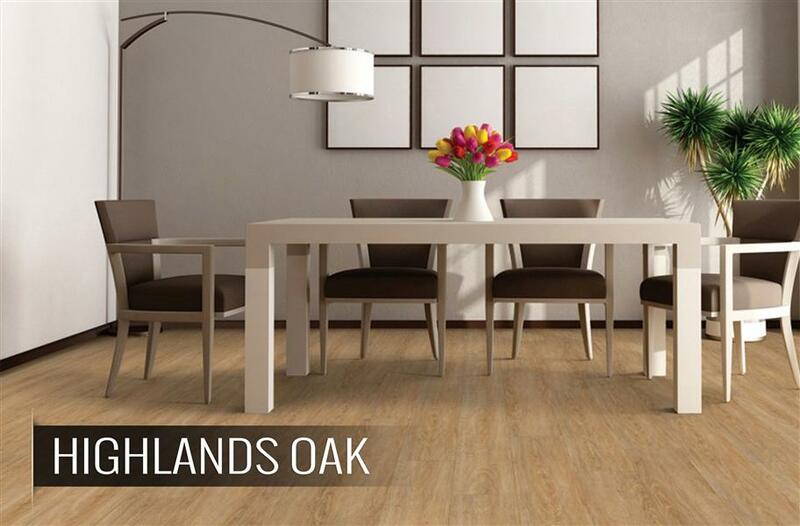 It’s true; blonde wood-look vinyl makes any room feel larger and more open, especially if you use large planks. But we’ll get to that later on. 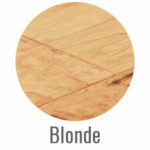 Will the blonde wood-look vinyl flooring trend last in 2020 and beyond? If you ask me, the blonde wood look will become a trend-turned-classic before you can even think about switching it up to something new. If you like them, go for it! They’ll be a hit for quite a while. Just a step darker than trending blonde, warm, rich honey wood looks will be taking 2019 by storm. Even just the sound of the word “honey” as it rolls off your tongue sounds wonderful, rich and cozy, don’t you think? Honey floors are still light enough to give you many of the benefits of blonde looks, making your room look larger and more open. But, you also get that nice, rich warmth that comes from a slightly darker tone. Warm tones will be trending across the flooring market in 2019 and, if you go the warm route, I would absolutely recommend a honey wood look. To be frank, the trends often drift back and forth between warm and cool tones. However, honey is not just a trend; it’s a color classic. 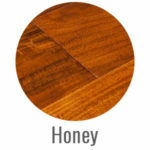 Will the honey wood-look vinyl flooring trend last in 2020 and beyond? I think this warm, cozy tone is definitely going to be around for the long haul. In fact, while other trends may steal the spotlight from time to time, I believe that honey wood looks will remain classic and relevant for decades to come. The whitewashed look is more of a west coast / California trend that is starting to spread across the country. Well, some parts. As that relaxed, California vibe is spreading, so are the floors that come with it. And white-washed wood is at the top of the list. In addition to the California, beachy look, whitewashed floors are also excellent for the now-trending farmhouse style homes (similar to the blonde wood looks we discussed earlier), particularly in the kitchen. Now, when I saw “whitewashed”, I don’t mean a smooth, finished white floor. Whitewashed wood and wood-look floors typically show signs of wear with the darker colors peeking out from underneath. 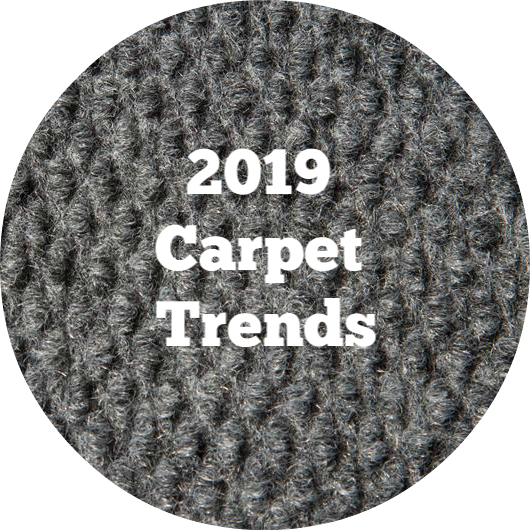 It fits right in with the 2019 aged and worn trends happening across all styles of flooring. Whitewash will make your home look brighter, bigger and more relaxed. It can give that “beachy” feel or also an upscale contemporary feel, depending on the rest of your decor. 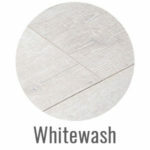 Will the whitewashed kitchen flooring trend last in 2020 and beyond? Over on the east coast, homeowners are still turning their nose up at the whole west coast look and feel. If this trend lasts, it will be regional, at best. If you’re looking for a light wood look, I suggest going for a more versatile blonde look instead. 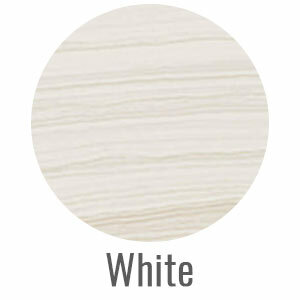 Just how the whitewashed wood look is trending, bright white vinyl tiles are also super hot right now. In 2019, the theme is contrast. You will see luminous whites contrasting with ultra-dark or bold, colorful decor. White vinyl tiles, like white and blonde wood looks, instantly make your room look bigger, especially if you use large format tiles. Put these vinyl tiles in a room with lots of natural sunlight for a truly special look. Will the white tile kitchen flooring trend last in 2020 and beyond? Yes! White is super hot right now. As dark looks near the end of their trend cycle, whites are only becoming more popular. Gray Vinyl Flooring – In All Looks! Five years ago, you could have called the gray trend new or up-and-coming. But now? Is it even a trend anymore? Well, if by “trend” you mean popular and relevant, then heck, yes! But it is definitely not a fad. Gray vinyl flooring, particularly in wood-look, has grown exponentially over the last decade. Although gray vinyl tiles, particularly in stone looks, are also very popular in the kitchen. 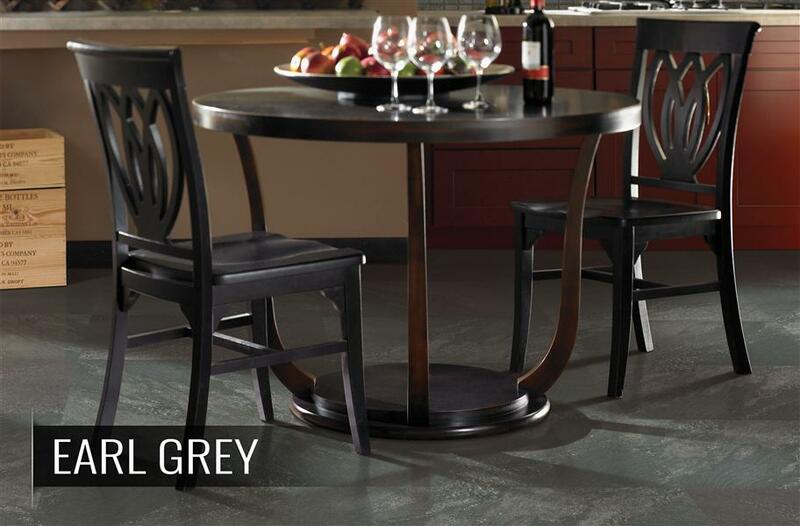 In addition to looking chic and trendy, gray floors set the tone of a cool, contemporary home. They give you a neutral backdrop for decorating in virtually any color. 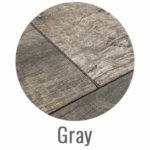 Aquas, greens, bright bold colors or even black and white – they will all go with your sleek gray flooring. Will the gray kitchen flooring trend last in 2020 and beyond? Heck, yes! Gray will be hot and trendy for decades to come. I wouldn’t give it a second thought! Oh my gosh, this stuff is just soooo cool! High color variation vinyl can feature variation between planks, in each plank or both. This gives you a look with lots of dimension and excitement that is, let’s be honest, less basic. And no one wants to be basic in 2019. 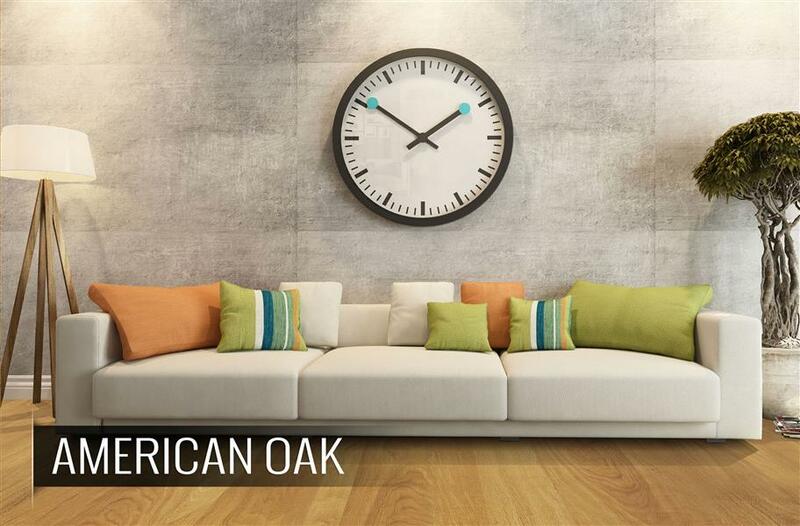 Homeowners love the natural, rustic look that higher color variation vinyl provides. In nature, stone and wood aren’t so uniform; there are all kinds of inconsistencies. Now, with modern technology, you can achieve these more random, natural looks with previously only available in specialty wood flooring with vinyl! This makes your floor more of a statement piece and tends to pair best with a simple but contemporary decor. Will the high color variation vinyl flooring trend last in 2020 and beyond? The challenge with something bold like high color variation is it’s a very specific aesthetic. I believe they will likely be trendy for the next decade or so. In 2018, I mentioned that patterns were hot. In 2019, It’s no surprise that patterned floors are still a huge hit. Unfortunately, when people hear the word “pattern” or the dreaded “parquet” (which, BTW, just means pattern), they imagine the horribly out of date 1970’s parquet floors. Don’t worry; the updated parquet looks are anything but dated. 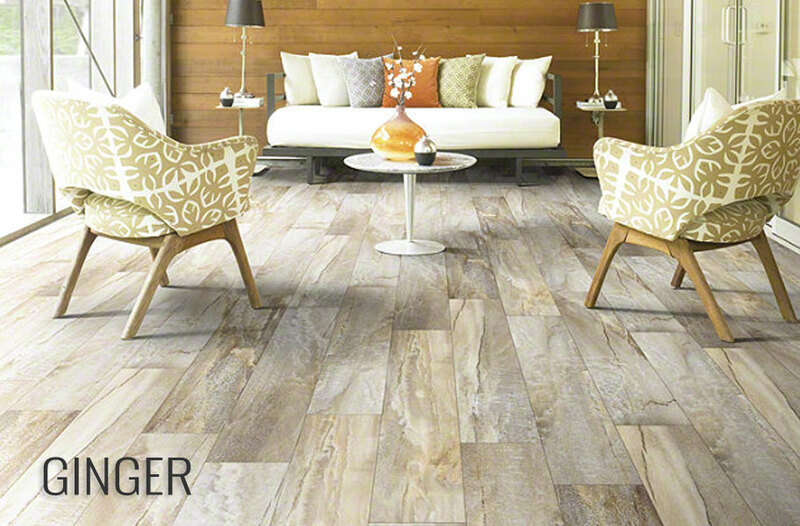 You’ll see sleek, upscale, modern patterns as well as the continuously growing large tiles and planks. First, let me clear up a little misconception. 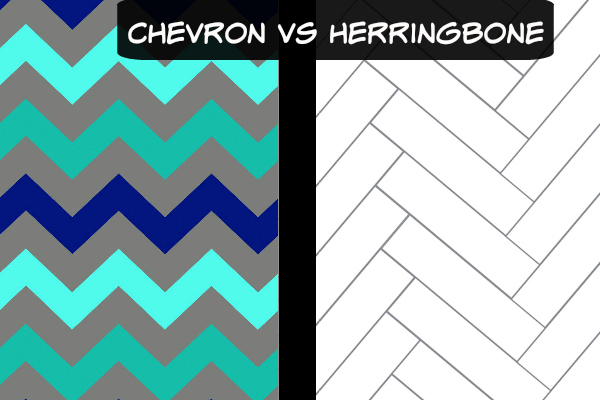 Chevron and herringbone are very similar, but each has their own distinction. Chevron floors require flooring to be angled and come together to a point. Although, some manufacturers are producing vinyl tile and vinyl sheet products with the hexagon and chevron patterns in the tile itself, which is pretty darn cool if you ask me. Herringbone achieves a similar look by connecting two planks at a 90 degree angle as seen below. For traditional vinyl planks, herringbone is much more accessible than chevron. However, the chevron vinyl tiles and sheets allow you to achieve this look without spending extra money on materials and installation. Long-plank herringbone patterns are going to be super hot over the next year, especially among young homeowners. But I suspect you’ll also see a surge in chevron tiles, especially in kitchens, as well. Will the chevron and herringbone vinyl flooring trend last in 2020 and beyond? This trend isn’t likely to last forever, but it sure looks pretty while it’s here. And, it will probably stay trendy in the kitchen the longest. *Note: The above picture is hardwood, not vinyl. It is there as a reference to give you an idea of the diagonal look. My favorite. 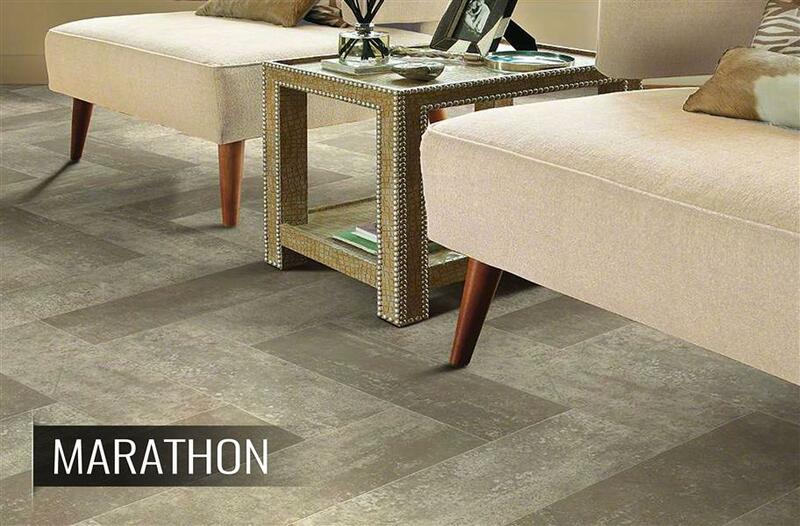 Laying your vinyl flooring diagonally instantly modernizes your home, making it look chic and expensive. The downside to doing diagonal vinyl floors is they do cost a bit more in both materials and labor. However, I think, if you can afford it, it’s worth the splurge and you’ll end up happy you did it. In fact, the above picture is from a friend’s house who installed these floors almost 5 years ago. He is still thrilled with his decision and gets compliments on it all the time. Will the diagonal vinyl plank flooring trend last in 2020 and beyond? Can it still be a trend if it’s uncommon? I think so. Yes, expect to see these angled vinyl floors every once in awhile for decades to come. The rareness, in my opinion, means this trend won’t quickly grow old like others – I expect it to have a longer shelf life. This is one trend you can expect to see every year in every style for the foreseeable future. Longer, wider planks make your room look larger, more open and less busy. Soon, short, thin planks will be seen as outdated. In fact, I would venture to guess that going with smaller planks could significantly reduce your home’s resale value. And also, they just won’t look as good. Now, I do think we’ll get to a point where enough is enough already and we will maintain these new traditional sizes. So don’t go buying one flooring plank for your entire living room. That would look weird. But, I definitely recommend getting on board with the large plank vinyl trend! Will the wide plank vinyl flooring trend last in 2020 and beyond? Manufacturers are only trending towards even wider and longer planks. This trend will soon become a classic staple and will likely last the test of time. 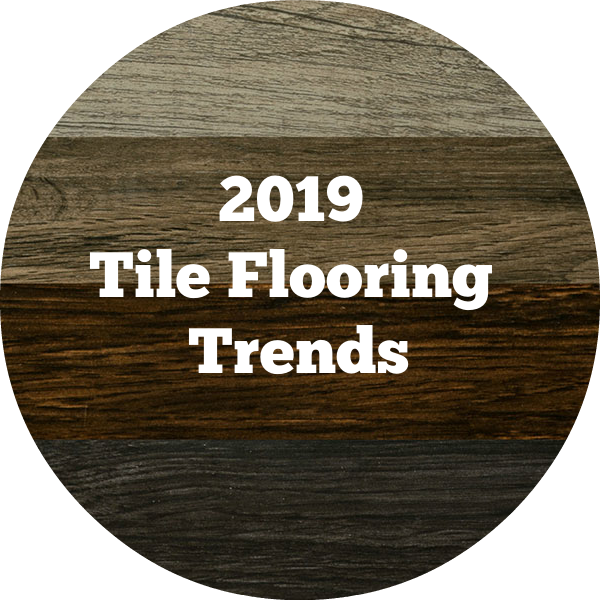 These babies have been trending for quite some time with manufacturers continuing to create larger and larger individual tiles. Wonder why they’re so popular? Large format vinyl tiles make your room look bigger, especially if you choose a light color. Just like large vinyl planks. Will the large format tile vinyl flooring trend last in 2020 and beyond? Without a doubt! Large format tiles and wide planks are here to stay. Now, this is a busy pattern I can get behind! While I still believe that, in most cases, smaller tiles make your room look smaller and busier, hexagon vinyl tiles and sheets are just so darn cool! Hexagon tiles first gained popularity in the early 20th century, typically accompanied by subway wall tiles. They can provide the classic, vintage look that is quite popular at the moment. However, you’ll also see ultra-modern, almost futuristic looks over the next several years. Imagine super clean, sharp lines, whites, blacks and grays, and a very minimalist decor. That’s this new futuristic wave of hexagon vinyl floor tiles. Will the hexagon vinyl flooring trend last in 2020 and beyond? Sparingly. I do believe you’ll continue to see hexagon vinyl tiles over the next decade. But, the bigger trend will continue to be larger tiles and planks. This is more of a niche market. 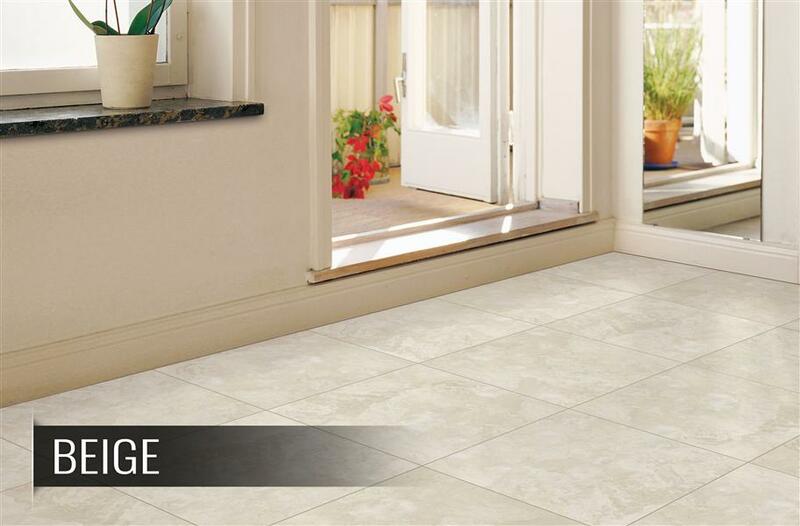 *Note: The above picture is porcelain tile, not vinyl. It is there as a reference to give you an idea of the mixed width look. This is another favorite. I know, I know, I’m not supposed to play favorites, but the mixed-width vinyl flooring trend is just so cool! Adding different widths to your floor makes your home look modern and unique. It adds that little extra something to your floor, making it pop. As you may have guessed, mixed width flooring is where you lay planks with varying widths. This gives the eye that extra detail, drawing attention when you find something unexpected. Basically, it’s really freaking cool. 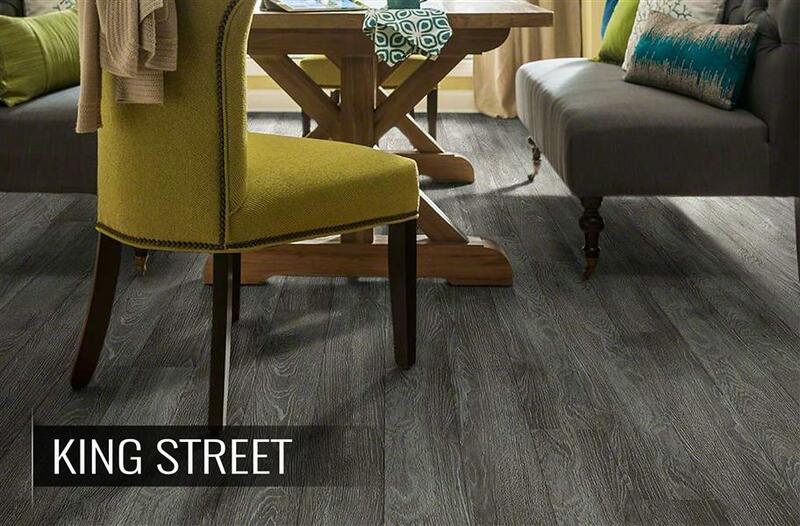 Mixed width vinyl flooring is a strong statement that adds a little extra drama to your space. But, the good kind of drama. Not the Jersey Shore kind. Will the mixed width vinyl flooring trend last in 2020 and beyond? 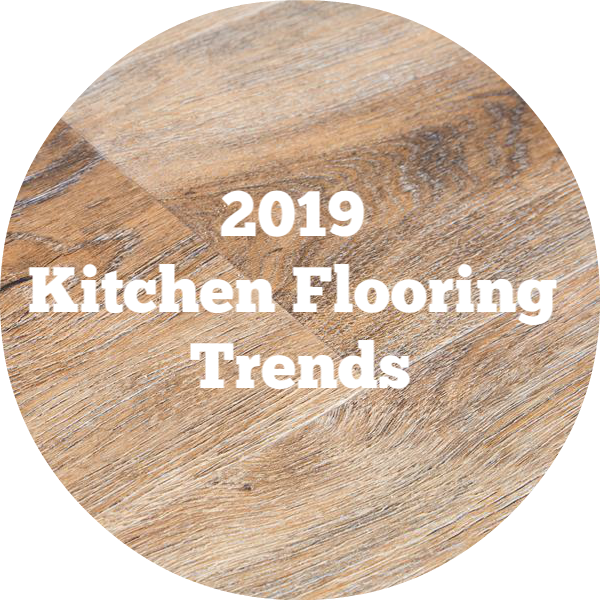 As far as longevity, we predict this trend will be around for a while, but it is unlikely that it will become a flooring staple. Did we miss anything? Leave it in the comments – we’d love to hear your thoughts! 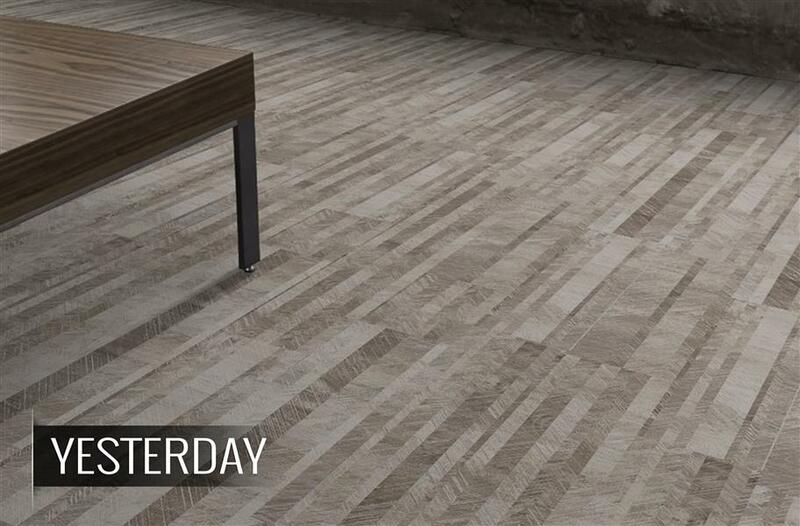 As you can see, there’s a lot going on in the vinyl flooring industry right now. There are plenty of different, unique options trending that will likely stick around for years to come, which means your possibilities are endless. If you want something hot that will last for the long haul, we recommend going for large plank, wood-look vinyl plank. Even better if it’s WPC! What about diagonal mixed width vinyl? We discuss both of those in the layouts section of this piece. Did you have a more specific question I can answer regarding diagonal and mixed-width vinyl floors? I loved the hexagonal vinyl look. It really does give off a retro-modern feel. My aunt is remodeling parts of her home, so I think she’d love to see these trends in vinyl. I’ll be certain to share this article with her. So glad you enjoyed it. Please let us know if you or your aunt would like any more information or help with free product samples. Having said that wider planks is better, is that limited by room size? I have an 1150sf lakehouse (575sf upstairs, 575sf downstairs). The downstairs is very open— one big room really. I was thinking of going with a high color variation in a 7” plank. Do you think a 9 inch plank would be more appealing In that size room? Great question – 7″ is plenty wide, IMO. In fact, it’s one of the most popular widths we sell. The thing about wide planks is they make the space look bigger – in a large, open space, you have more freedom to play around with widths because the space is already large. I would recommend checking out the TritonCORE 7″ – it’s super popular and perfect for an open space like that. Thank you for your article, it’s very informative. What would you recommend for a kitchen that currently has old ugly laminate (white) and light colored wooden cabinets? The living room/dining room connected to the kitchen have medium colored wood floors. Personally, I love contrast. If you have light-colored cabinets, it may be overkill to have a super light floor. I would suggest trying out a gray or honey wood look to nicely complement everything else you have going on. Make sure you order some samples first to see how the colors look in your home. If you’d like help with that, I can get you in touch with one of our flooring experts to send you out a couple free samples for your convenience. Great, thank you Ari! Samples sound great. We are considering installing WPC vinyl plank flooring and will likely sell our house in about 5 years. (sprucing it up for resale and hope to enjoy a few years with the improvements!) I am trying to decide whether smooth or more textured will be more attractive for resale. Smooth seems to mimic the majority of hardwood floors currently out there, so buyers might think it looks more like hardwood. However, it seems like the textured is gaining in popularity. Any thoughts or recommendations? WPC is great for resale, so it’ll be a good choice for any future selling plans! As far as texture, I think that also depends on the style of the house. Some more traditional styles benefit from smooth floors, but for more industrial and contemporary looks, texture is the way to go. I have a strong feeling textured floors aren’t going anywhere, so I’m sure either choice would be successful! As a suggestion, our WPC brand TritonCORE has both smooth and textured looks. What happened to the “Wet Look” Vinyl floor coverings? Everything today is a semigloss finish. I recall reading something about loose-lay vinyl planks being inadequate flooring for anyone using mobility equipment. Perhpas this was referring to older designs and this may not be a concern with the new rigid core planks. Can you advise? Loose lay installation is usually best for lower traffic areas. To help secure loose lay installations a little more for higher traffic, some people use double-sided tape when installing. My suggestion would be to use an interlocking installation method instead to ensure the floor doesn’t move when using heavier mobility equipment. I have an open floor plan. I have old small planks with oak color in the kitchen and in the living room is carpet that I want to tear out. I would like the gray stained wood look from the vinyl. My carpenter said that you could do a whole different size plank and leave the kitchen going vertical with small planks and re-stain it, then have the living room planks going horizontal with the bigger planks, I’m just not sure about that. Great question. I would say if it’s in your budget to redo both floors, you might as well take the small planks out of your kitchen while you’re at it. 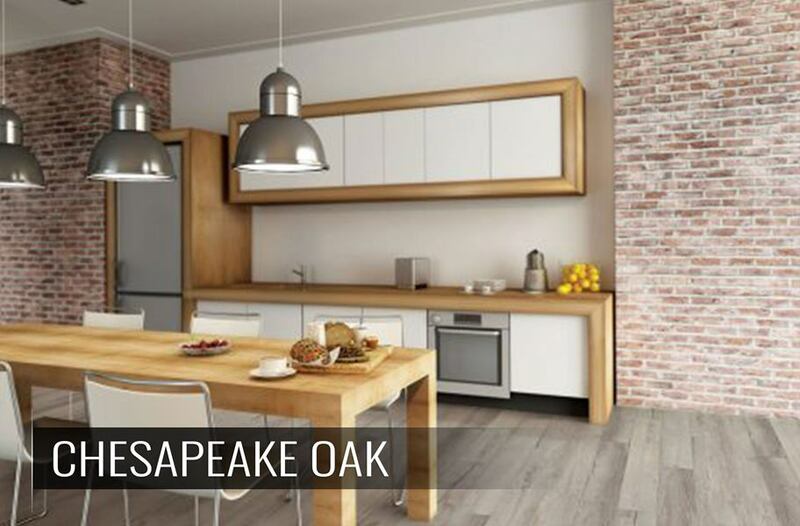 The smaller planks really are on the edge of being outdated, so we believe that going with medium to larger plank sizes can help your home’s resale value. The bigger planks are getting more and more popular. But the gray wood look is a great option! Gray floors will be trendy for years and they’re gorgeous. Would like to know if the waterproof wood-look vinyl floor would be good for a California Room outdoors? We are considering this flooring throughout the house, and would like to extend the floor into the covered patio room. Great question! We do not typically recommend waterproof vinyl for outdoor use because it can fade in sunlight, but if your patio room is covered then waterproof wood-look vinyl would absolutely be an excellent choice! Plus, having the same flooring extending to outdoors is a great way to create that seamless indoor/outdoor transition that’s really trending right now. Good luck with your project, and please let us know if we can help! I thought it was interesting how you talked about longer, wider planks to make the rooms feel more open, bigger and less busy. My husband and I have been talking about what we could do with our flooring to have this kind of effect. It seems like this is the style to go with and I’d really like to see what kind of options vinyl flooring has that might go with our design. USFloors COREtec Plus is an evolution in luxury vinyl flooring. Being an entirely new category of flooring called Engineered Vinyl Plank flooring or, EVP for short, these planks and tiles are by far the most durable on the market today. 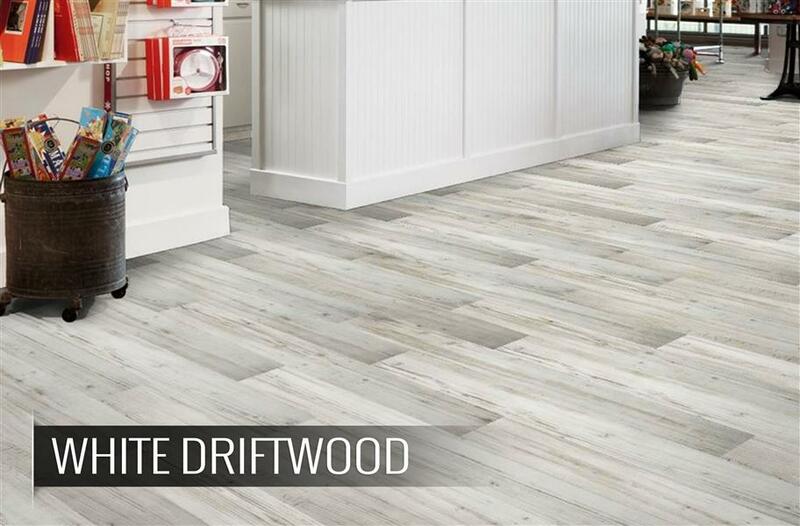 USFloors COREtec Plus 7 engineered vinyl planks are highly durable medium width luxury vinyl flooring planks that are sure to stand up to the test of time. Prospects vinyl tiles are a durable, low maintenance, and affordable alternative to natural stone. Pro Plus has many of the same wonderful features as the standard Plus collection, except that this line has a lower profile, at 5mm thick, and features rigid core construction. Aged Wood Vinyl Planks offer a beautiful and realistic hardwood flooring look that is sure to add an inviting warmth to any space.